There are a number of metrics that are used to evaluate the quality of primary care for children (for a link to the Environmental Scan of Potential Primary Care Indicators for Children and Youth, click here). Unfortunately many are not routinely available in Canada. 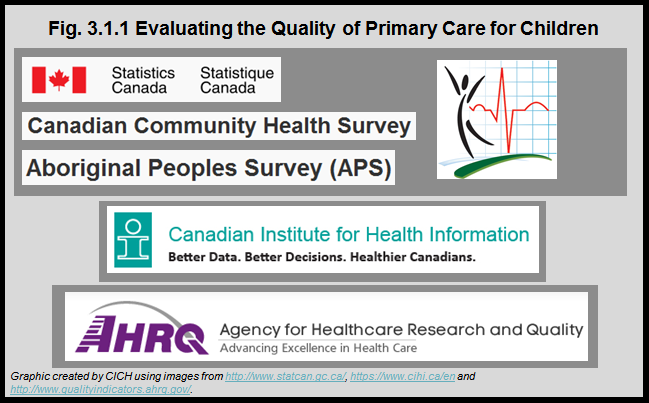 We used two national Canadian surveys – the Canadian Community Health Survey and the Aboriginal Peoples Survey which include questions about access to primary care. We also capitalized on hospitalization data available through the Canadian Institute for Health Information to describe potentially preventable hospitalizations, those for acute exacerbation of chronic problems (asthma and diabetes) and acute conditions such as gastroenteritis with dehydration (stomach flu) and urinary tract infections for which timely medical care could prevent the need for hospitalizations. These conditions, known as ambulatory care sensitive conditions are often used to measure the quality of primary care services.1 Finally, childhood immunizations are a key indicator of primary care. There is no single source for these data in Canada.